RV Parks that provide high speed Wi-Fi to residents provide a significant benefit that residents will value. 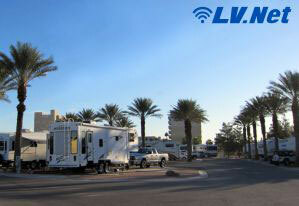 Many RV Parks provide free or low cost Wi-Fi to those living in their parks. Internet service can be provided as a Wi-Fi network that covers all parts of the park without using fiber cable. With the increasing availability of Internet access everywhere, many guests and residents are expecting to have Internet access wherever they are located, including from most any business involved in providing hospitality as part of their service. High speed Wi-Fi Internet is a good option for RV Parks that want to provide the best in high speed Internet for their residents, to make sure that guests’ needs are provided for, and for residents that have decided for themselves that Internet service is a requirement for where they choose to stay. Installing high speed Wi-Fi Internet from LV.Net is a good option in order to ensure that residents have the best opportunity to receive quality Internet service without problems associated with impaired service caused by signal interference from nearby Internet users in the situation where access to Internet service is not managed by a limited number of service providers. LV.Net’s high speed Wi-Fi Internet provides Internet access through its top tier microwave network. LV.Net’s microwave network can provide speeds of up to 1Gbps without difficulty. If you need the best in high speed Wi-Fi Internet to serve the needs of any size RV park, please call LV.Net at 702.900.0000. We have 18 years of experience providing the best Internet service, we are willing and able to install top tier high speed Wi-Fi Internet for RV parks located anywhere in Nevada.